Looking to serve a sophisticated, visually pleasing side dish this spring? 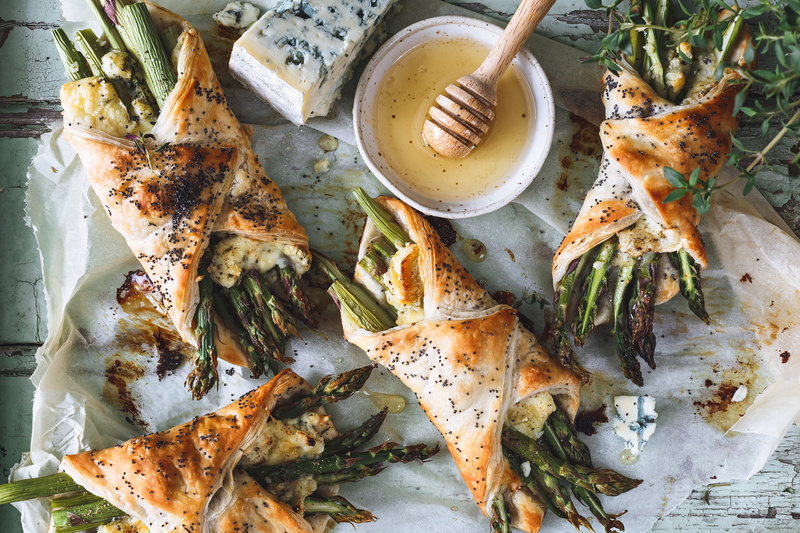 Buttery puff pastry, creamy Gruyere cheese, tangy blue cheese, roasted asparagus and sweet honey all come together in this simple recipe. These pastries are great for an Easter brunch, as a side dish, or even as a light lunch, making them perfect for entertaining. As much as I love to make sweet treats this time of year, it’s always nice to share some new savory recipes. Since during spring the fresh produce is so abundant and beautiful, it’s time to take advantage. I like to use the frozen puff pastry sheets from the grocery store instead of making puff pastry from scratch. It is much easier, and just as delicious. Thaw them in the fridge overnight, or on the counter for a few hours. Another tip is to use thin asparagus. 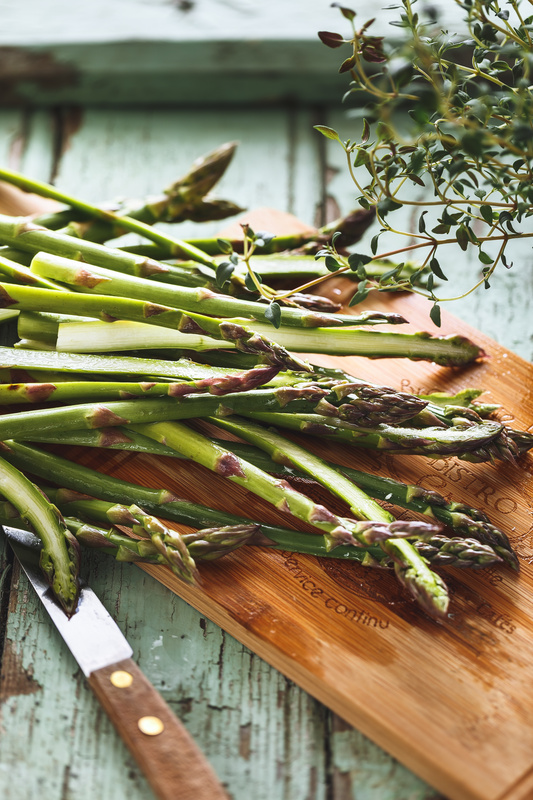 The thinner asparagus cook up nicely, and are much easier to work with than the thicker variety. Last but not least, don’t forget to drizzle the pastries with the honey, butter and thyme mixture once they are done cooking. This makes all the difference and really elevates the dish. 2. Toss together the asparagus, olive oil, salt and pepper. 3. Roll the pastry sheets out on a floured surface and cut into 8 squares. Evenly distribute the Gruyere and blue cheese on each square and then add a handful of asparagus. 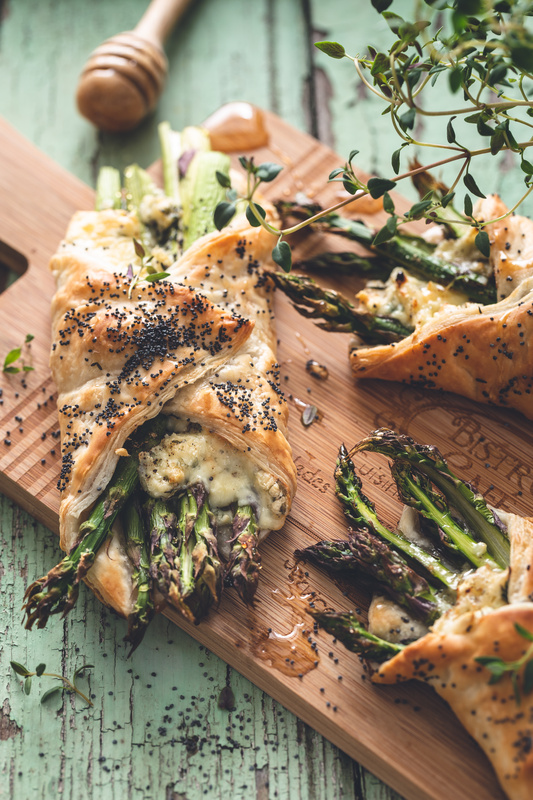 Take 2 corners of the pastry and wrap up and over the asparagus to enclose. Transfer to the prepared baking sheet. Repeat with remaining squares. Brush each pastry with egg. Sprinkle with poppy seeds (if desired, not necessary). Transfer to the oven and bake 20-25 minutes or until golden brown. 4. Meanwhile, melt together the honey, butter, and thyme in a small saucepan over low heat. 5. Serve the pastries warm, drizzled with the thyme-honey mixture.